March-2010: New Solid Bearing/Friction Slide Launched! 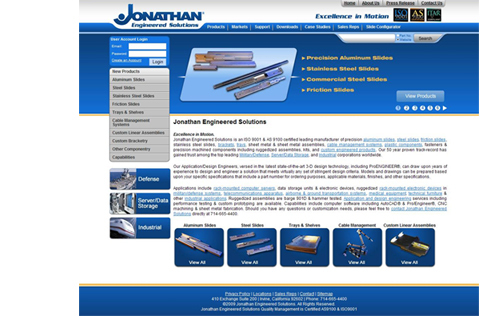 Jonathan Engineered Solutions is pleased to announce to the market new non-bearing/ friction slides targeted to the defense/aerospace, server/data storage and industrial markets. Jonathan Engineered Solutions has released 4 new products to the marketplace, which includes the 510QD (carbon), 510QD-SS (stainless), 510QDG, and 515QD (aluminum) slides. Solid bearing, also known as friction slides or non-ball bearing rails, are an alternative to use when ball bearing slides are not recommended, or when a potential issue could arise from loose ball bearings that may be caused from mis-alignment during re-assembly. Jonathan Solid Bearing Slides provide a precision smooth motion, provides interchangeable inner members, full travel potentials, and has a thin cross section capable of handling loads typical of thicker ball bearing slide profiles. Jonathan Aluminum Solid Bearing Slides are a rugged and durable product that can meet and exceed military and environmental conditions, including MIL-901 specifications. *If you have any questions, please contact our sales engineer at 714-665-4400. Direct personal by territory can be located here. In this press release, we would like to announce the launch of our new website! Jonathan Engineered Solutions- Excellence in Motion. In order to accommodate to mechanical engineers we have added: new 3D CAD viewers, product spec-sheets PDFs, dimensions (length, width, height, weight, travel) engineering tables, download-able product catalogs, markets (Defense/Homeland Security, Server Technology, Industrial, Heavyweight Vehicles, Commercial Aerospace, Vending, Medical) focused pages, and more. We have also added a slide configurator to help engineers design a slide to meet their applications. Jonathan Engineered Solutions is pleased to announce new standard shelf assemblies. The standard shelf assemblies are sold completely assembled and ready to be installed into the cabinet. New products include the T1U-100, T1U-200, T2U-100, T2U-200. Trays are available in 1U and 2U and comes in a variety of lengths. Accessories include the cable management, anti-slip pads, server straps and the trays are fully customizable. Please contact Jonathan at 714-665-4400 for further information.